Game Seven of the World Series. As classic phrases go, it doesn’t get much better than that! I don’t really have a favorite in this one, but it’s hard not to be rooting for the Cubs. 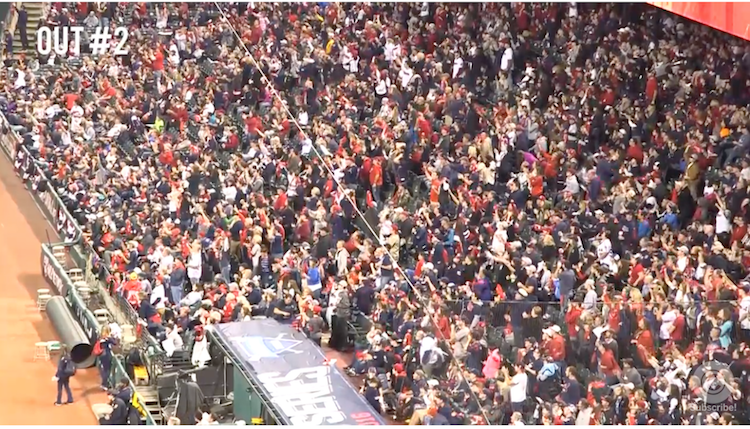 Still, if they do win it, it’ll certainly be tough not to feel bad for fans in Cleveland. These fans in Cleveland are reacting to the game played in Chicago. The Indians drew more than 67,000 fans to Progressive Field for games three, four and five of the series … which were played at Wrigley Field in Chicago! These fans paid $5 for a ticket (proceeds going to local charities) to watch the game on the giant video board. This has become something of a thing in recent years, but fans have been gathering to follow their teams on the road like this for more than a century! When the Winnipeg Victorias hockey team traveled to Montreal to play their Victorias for the Stanley Cup in February of 1896, telegraph wires were run to local hotels so that Winnipeg fans could receive play-by-play updates during the game. Soon, fans all across Canada were showing up at train stations or outside of newspaper offices to “listen in” on these telegraphed reports. 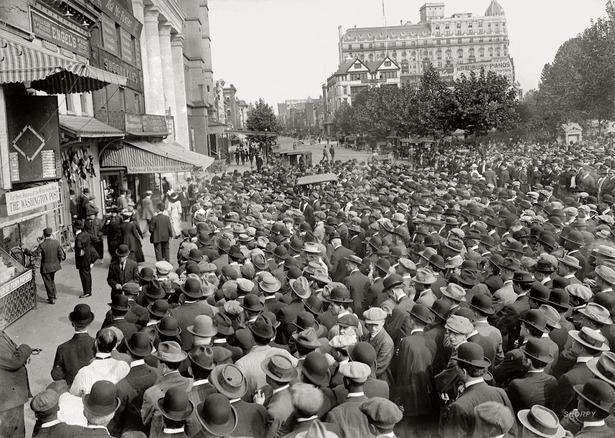 As early as 1907, fans gathered inside the rink in Kenora, Ontario, to receive updates from Montreal as the Thistles battled the Wanderers for the Stanley Cup. Fans gather in the street to follow the World Series. 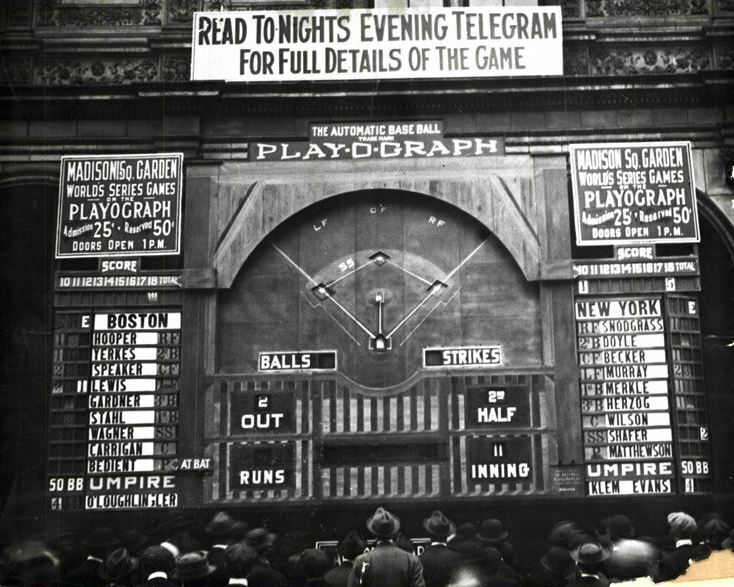 Baseball has similar traditions, with a history of elaborate electronic scoreboard devices set up in American cities to follow the action of the World Series. Often, these devices drew big crowds in the streets outside of newspaper offices, but there were also set ups in theaters, armories, and other reception halls. Ads in the New York Times in 1915. My favorite of these old-time devices is something call the Jackson Manikin Baseball Indicator. It was like a giant arcade game which used mechanical men to re-enact each play in a game as it was received via telegraph. For more on this one, you can see a story I wrote a few years ago for the Society for American Baseball Research. 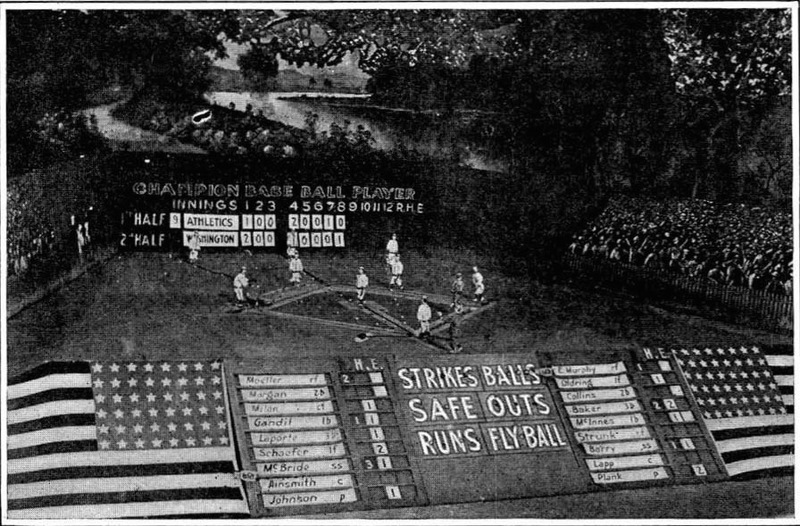 The Jackson Manikin Baseball Indicator, circa 1913. 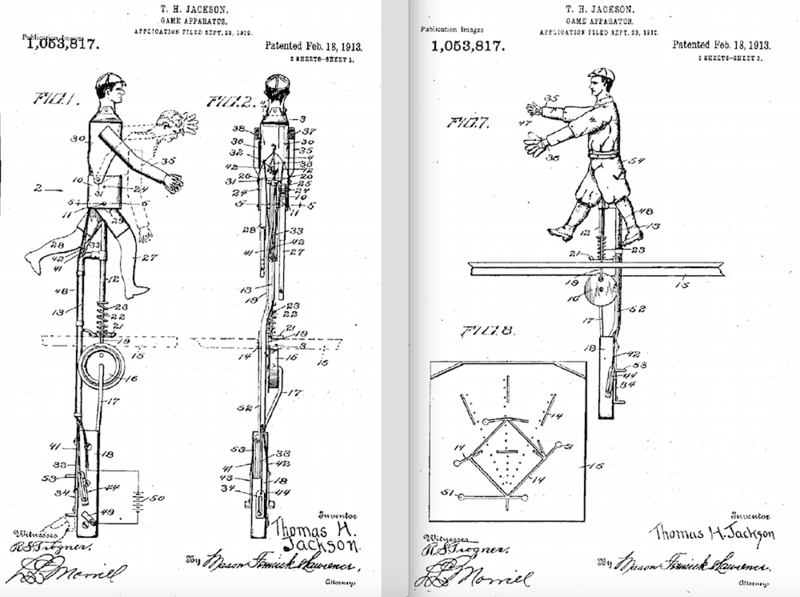 Details of the Manikins from Thomas Jackson’s patent application. And during the 1926 Junior World Series when the Toronto Maple Leafs defeated the Louisville Colonels, fans in Louisville had a unique way of following the action when their team was in Toronto. From The Globe in Toronto, October 5, 1926. So, as it so often seems to be, the more things change, they more they stay the same! Wonderful piece! LOVE the ‘Jackson Manikin’ ANNND “LOUISVILLE “SEES”….”! Beauties! However, re Cleveland; their attendance and interest in their team has been, quite frankly, TERRIBLE! Terrible this year, last year, the last decade….even down-the-stretch in THIS, their pennant winning, WS year! “You’d think that a ticket to the Indians-Tigers series would have been hard to come by, given the longtime rivalry – the Tigers and the Indians entered the American League in 1901 – and the implications for the postseason. But the team only drew, on average, about 25,000 for this meaningful September series, about two-thirds of the Progressive Field capacity. Tickets on StubHub were going for less than $10. And based on the number of fans wearing Tigers gear, it was obvious that a few thousand of those in attendance had driven the two and a half hours from Detroit. The numbers for this series were no aberration. The low attendances for the Indians this summer are causing some head-scratching among sports business experts. The team has been in first place since early June, but are third last in the league in attendance, ahead of only Oakland and Tampa Bay. The league average is about 30,000 a game, and the Indians are drawing just under 20,000. And yet the team has been reasonably successful over the past decade. Counting this year, the Indians have been .500 or better in six of the past 10 years, and barring some unforeseeable collapse this year will be the third playoff appearance for the Tribe in the past decade. But despite those successes, the team has been in the bottom third of Major League Baseball attendance in every one of those 10 years. Between the game tonight and worrying about the election, next week, I’m exhausted! Thanks Tosh for all that info. When I think of how early we had to leave our houses to get a place to park for a Jays game, how long we had to wait in line to get in and how many innings we missed if we went up to get some food, we should have been playing Chicago in the World Series. At least Chicago won. And for us Jay fans, I grew up rooting for the Brooklyn Dodgers, so my mantra is: wait til next year. 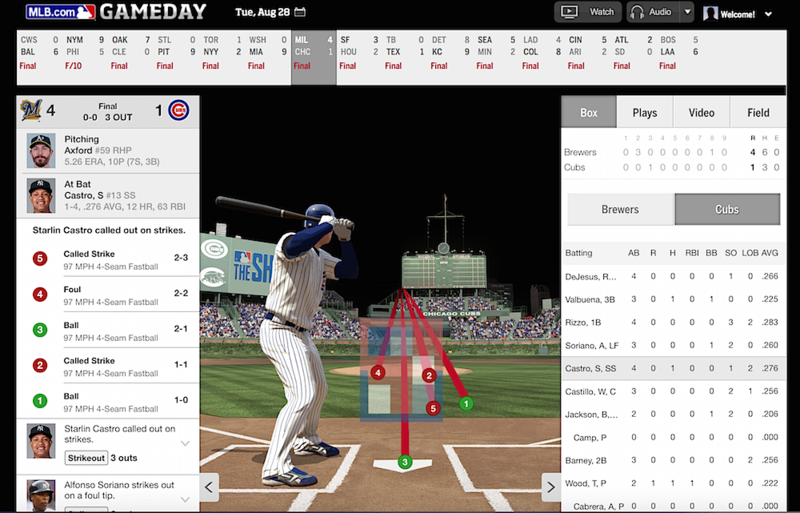 I have to say I want the Cubs to win….it has been far too long for them!! !